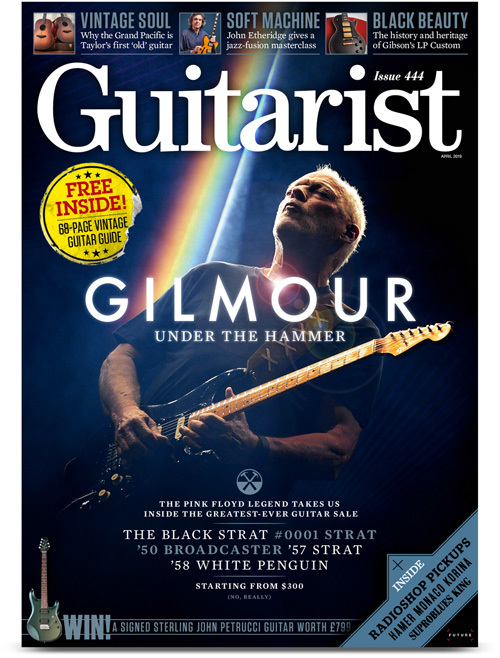 The current issue of the UK's Guitarist magazine (issue 444) will be of interest to many of you, whether or not you actually play the instrument. 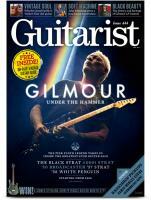 As you may have guessed from the cover image (click the thumbnail to see it in more detail) the magazine features as its key article, a nicely illustrated 14 page look at the upcoming David Gilmour guitar auction. As you are sure to know by now, the auction, at Christie's New York in June, will see some 120+ of David's instruments being sold off. Guitarist chat with David about his motives with this sale, ask him about some of his favourites which are going, and about which guitars he just couldn't part with - and why. There's also a close look at a number of the key guitars in the auction, with some fascinating background. They look at the provenance of the instruments, and talk about the alterations that some of them have had to fit David's playing preferences. The magazine also comes with a free supplement exploring the world of vintage guitars, whether or not you will be trying your best to successful bid on one of David's guitars in three month's time! You can order this magazine online, worldwide, through this direct link to the publisher's own eStore. Alternatively, if you are in London this week to view David's guitars at Christie's London HQ, certain stores and newsagents will have the magazine on their shelves.